My eighteen month old (didn't she just turn one?!?) tends to make an absolute mess of herself on a regular basis. I made the bapron to bring with us when we go out to eat in order to increase the chances that we'll make it through a meal without completely destroying an outfit. And not only does she leave it on, it pretty much covers her entire shirt, which is key. 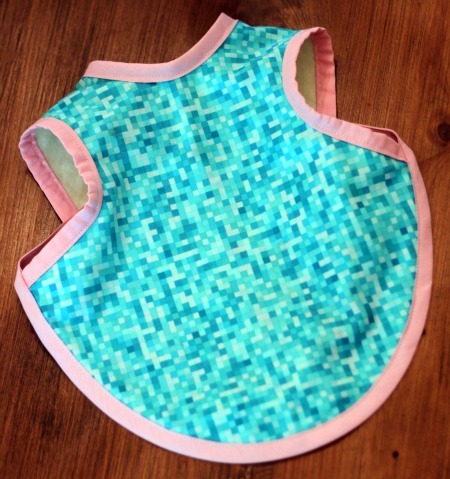 This is a really quick, easy, and fun sew, and I'm definitely throwing this on my list of baby shower gift ideas. Love it! Too cute. Your daughter is adorable. Thanks so much for linking up to the party. We still have to get together for a crafting day at my house. This summer has been crazy and now we have relatives visiting for the next 2 weeks. Let me look at my calendar...maybe in September when things calm down a bit. awesome bapron, Gwen! 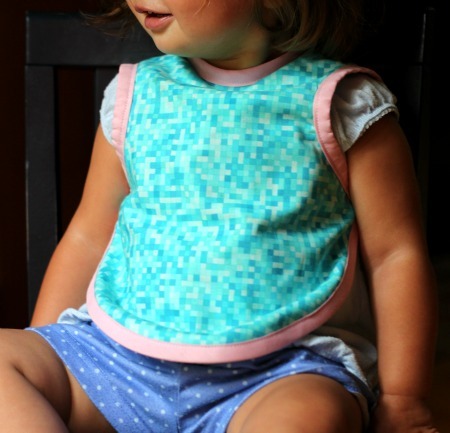 love the pixel fabric! I need to make about 5 of these! 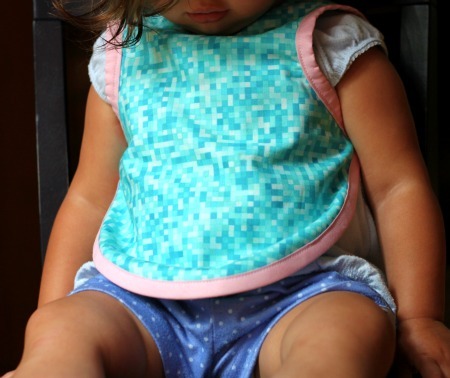 Lily will not keep regular bibs on and her clothes are getting stained! Think I will try these soon. I'm so excited!! Thanks for posting about this! I really love how yours turned out and I am always looking for handmade baby gift ideas. This is a great project for bias tape too. I wish Jess had posted this a year and a half ago...perfect for older babies. hi! what size of bapron is your daughter wearing on the above picture? @eva - I sent you an email... My "baby" if five now, so I don't remember what size this was :) Sorry I can't be of more help.